Join us for our second Story Slam! 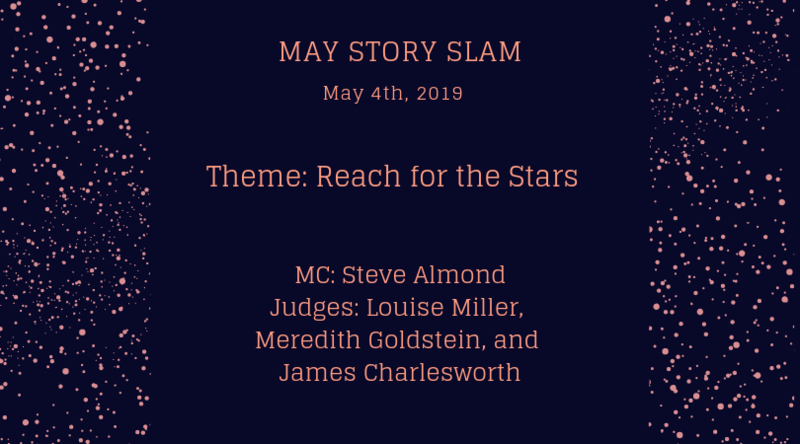 Once again hosted by Steve Almond, this event's judges will be authors Meredith Goldstein, Louise Miller, and James Charlesworth. The theme is: Reach for the stars. We ask that all participants keep story length to around 5 minutes and don't use notecards. The winner will receive a $25 Black Bear Cafe gift card and the title of Story Slam Champion! Craft Beer Cellar will be serving beer and wine a well as hosting a happy hour starting at 6pm. Doors will open at 6:45pm and seating is first come, first served, but do let us know if you or anyone in your party requires a reserved seat. An overflow room with extra seats will be available with the event streaming live. Tickets are $13 each and can be purchased online or in store - but hurry, we have a limited number! Please note: If you were a storyteller at our last event and want to participate again we ask that you sign up for our waitlist first to enable all new storytellers the chance to participate.